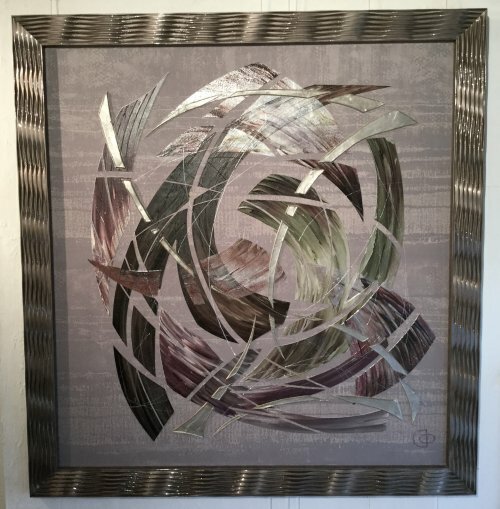 This original painting is executed on a textile wall covering which provides a wonderful texture and an abstract pattern in taupe and silver colours in the background. The frame is also a 3D design in a metallic taupe colour, beautifully complementing the back ground wall covering and the painting itself. A mixture of aubergines and purples with olive greens and subtle lime colours if "toned down" with the neutral shades which will make this piece easy to fit in practically in to any interior scheme. The painting is full of movement and life with a mixture of matt oil paints and transparent and iridescent paints layered over each other.